Very seldom do I make weekend posts...but today, I am...not just to announce UPrinting.com's giveaway winner, but also because today is a very special day! It is my wonderful husband's birthday! Ryan turns 38 today! We've been married for 11 years now, and it's the 17th year that we're celebrating his birthday together! Yeah...that's right...we've been together that long already! We've actually known each other since we were in 6th grade. We went to the same school in elementary and we both took up Engineering at the University of Santo Tomas. He became my boyfriend when we where in third year. We've been together for so long and I honestly say that I can't imagine my life without him! Ryan is such a loving, patient, understanding, and supportive husband who never gets tired of me and my shortcomings (especially since I started blogging). He's my best friend in both good and bad times. He’s a phenomenal dad, the best husband, a truly all around awesome guy, and for that and so many other things, he is and always will be the greatest love of my life! A VERY HAPPY BIRTHDAY TO YOU, LOVE! Wishing you a longer healthy life! I am truly so lucky to have you...and I am so happy to share my life with you! I want to dedicate this post to Ryan by sharing with all of you one of the two special desserts I made for him yesterday (the other one I'll share with you on Monday). I made them in advance so I can spend the whole day with Ryan and the girls. These are 2 of his most favorite desserts that he will surely enjoy after we watch a movie and eat out later. The first one is Cathedral Window (some call it Broken Glass). 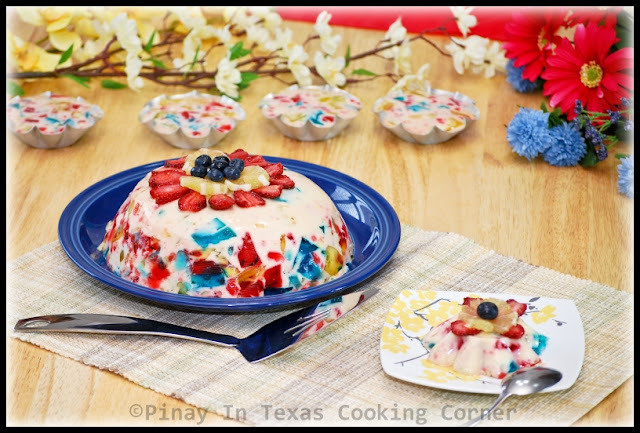 Though not Filipino in origin, this dessert has always been part of all our family gatherings, as far back as I can remember. It was my favorite when I was growing up, and Ryan's too! It's so colorful and yummy to eat so I guess all kids love it! 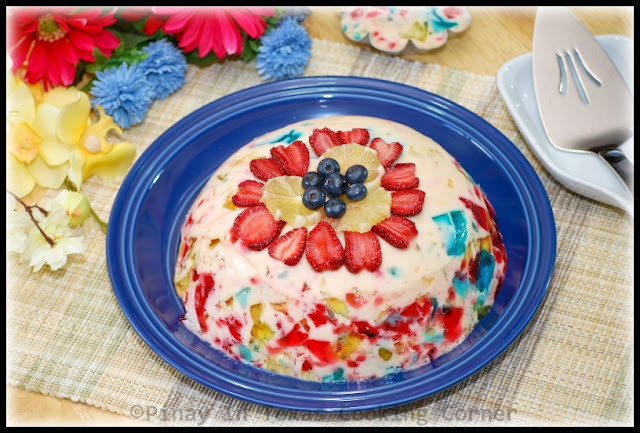 The name of the dessert, cathedral window, is a description of its appearance - brightly colored cubes of jelly against a creamy white backdrop, resembling stained glass cathedral windows. 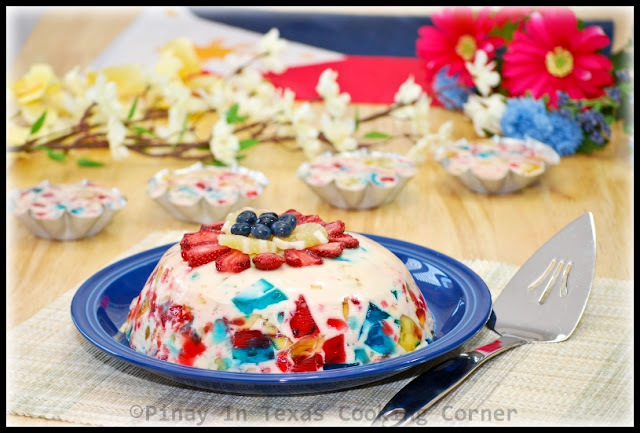 The Kulinarya Cooking Club's theme for August & September as chosen by the four wonderful hosts, Ray of Wok with Ray, Oggi of I Can Do That, Chef Theodore Salonga of Chef by Day and Boyet of Reel and Grill is red, white, blue and yellow which are the colors of the Philippine flag. We're being patriotic here! 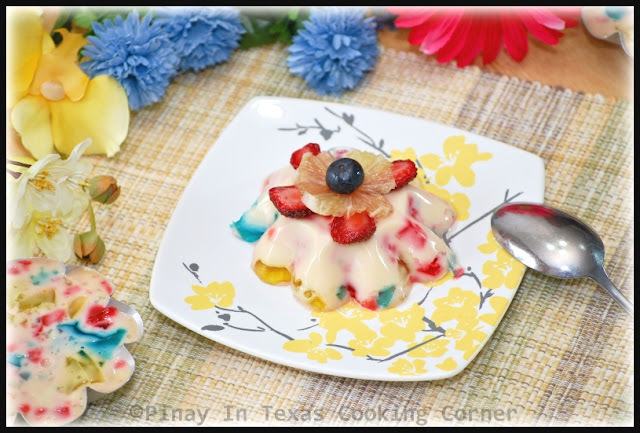 Not only are we paying homage to our flag and country, we are also trying to honor our national heroes by sharing with you Filipino recipes with a hint of red, white, blue and yellow! This is actually my first post for Kulinarya Cooking Club so I'm so excited about it! Though the hosts' rules include not using artificial coloring, the jelly I used had artificial color...so to compensate for that, I topped it with fresh blueberries, lemon and strawberries, even though Cathedral window isn't usually served with toppings. I wanted to use white agar-agar and color it with blueberry, lemon and strawberry extracts but I wasn't sure if I will get a jiggly outcome so I just stuck to the boxed jell-o. At least I have all the four colors required right! :) Ryan and the girls said it's beautiful...what do you think??? 1. In a small bowl, mix sliced strawberries and 2 Tbsp sugar. Do the same with the lemon slices (you're doing this to slightly cover the sour taste of both the lemon and strawberries). Set aside. 2. 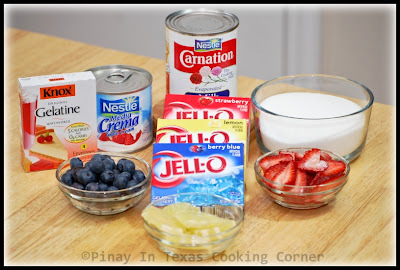 Prepare each flavored jell-o according to package directions, i.e., add boiling water to gelatine mix; stir 2 minutes until completely dissolved, stir in cold water and then refrigerate until firm. 3. When firm enough, cut each flavored gelatine into cubes. Set aside and prepare the binder. 4. 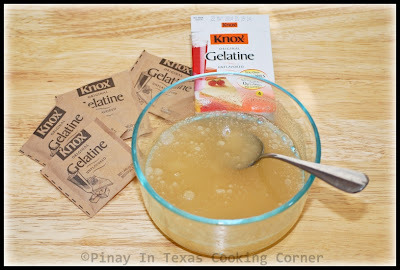 Dissolve 4 envelopes of Knox Unflavored Gelatine in 1 cup cold water. Set aside. 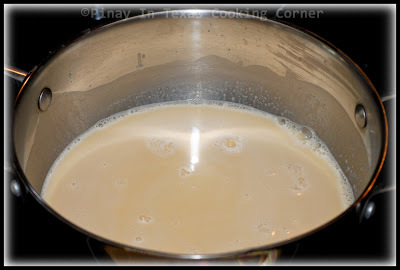 In a sauce pan over low heat, mix evaporated milk, table cream and sugar. Keep on stirring until sugar is dissolved. 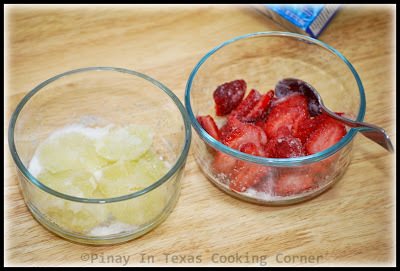 Add gelatine & water mixture. Stir until well combined. Remove from heat. 5. Transfer to desired molds. 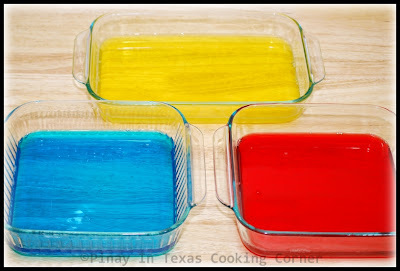 Allow to cool down and slightly set before adding the cubed flavored gelatine. (If you add the cubed gelatine when the binder is still hot, they will sink to the bottom.) Stir gently for a well distributed color. Chill in the refrigerator until redy to serve. 6. To give it additional hint of red, blue & yellow, I garnished it with blueberries and lemon and strawberry slices. Joy on Red, Yellow, Red and Blue? ...Jessica of Kitchen Belleicious! Congratulations Jessica!!! 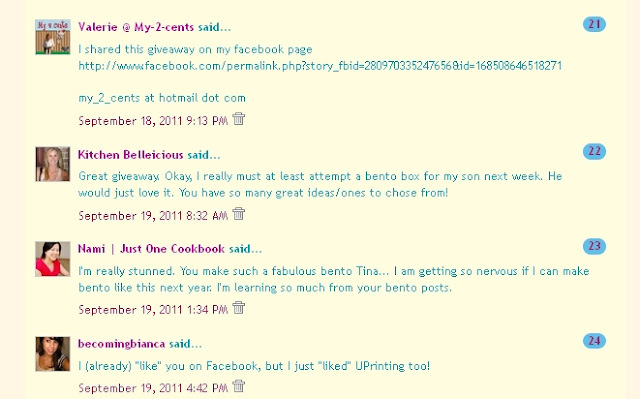 The wonderful people at UPrinting.com will be contacting you soon. Again, a BIG THANKS to UPrinting for this awesome giveaway!!! Happy Birthday to your hubby Tina and enjoy every moment of the love you both have for each other. Btw, my hubby celebrates his birthday in another 1 1/2 hours and I am preparing lunch for him tomorrow which he always looks forward to on a Sunday. 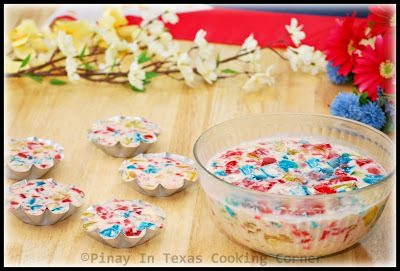 Its such a colorful and gorgeous looking dessert you have made, another creative outcome. Thanks Nava! A very happy birthday to your husband too! Happy Birthday to Ryan!!!! What a lovely gift to make for his birthday! It's fun, gorgeous, and sounds absolutely delicious! Have a great weekend!!!! Happy birthday to Ryan. Great dessert... colorful. Congrats to the winner. Happy Birthday Ryan! Tina, you two are sooooo cute together... I love the big heart shape collage!!! Your photos make me feel warm and happy and thanks for sharing love! 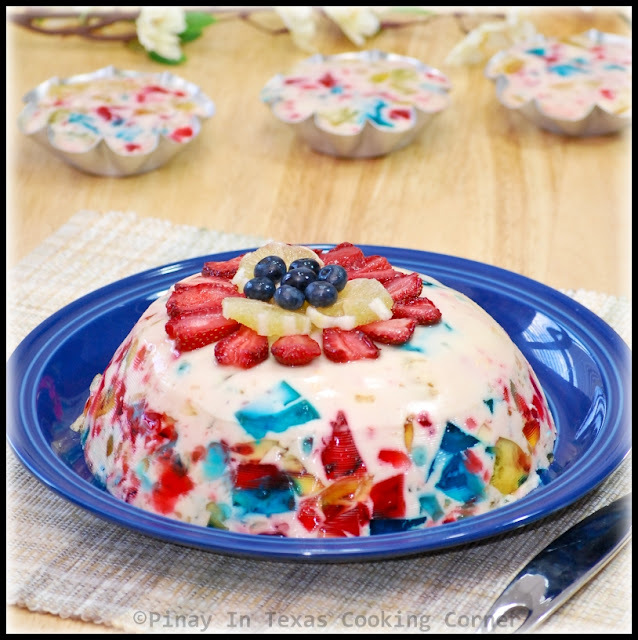 Love the dessert and I thought we can do July 4th with this color theme (minus yellow)! Such a pretty dessert! per favore complimenti Ryan da parte mia. E auguri a tutti voi. Happy birthday to your husband! This is a good combination of beautiful colors! It is indeed looks like stained glass masterpiece, Tina! Well done on Kulinarya entry! It's beautiful how all came together. Great job :) and happy b-day to your hubby and many more. Wow ! that is sooo beautiful ! I will try to make that soon ! Wow that was smart in expressing all the colors representing our flag. Didn't join this month's Kulinarya theme but glad you did. Happy Birthday to hubs and more years for the both of you to share the love you have for each other. A love that started 17 years ago. Cheers! Birthday wishes to your husband. I'm sure your special birthday dessert was enjoyed by all. Happy birthday, Ryan! And congrats to 17 years together. That's a fine achievement! And your cathedral windows is pretty. My mom loves to make gulaman for dessert, too. Thanks Jun! Nice to see you here! Happy birthday to your Bana! Cathedral window is a happy dessert for me because of its colors. Happy Belated Birthday! What a lovely story, and cute photos!!! Jello look so yummy!! I love to stroll around your blog and discover some amazing recipes like this one!! Wonderful Cathedral Window!! Hi! 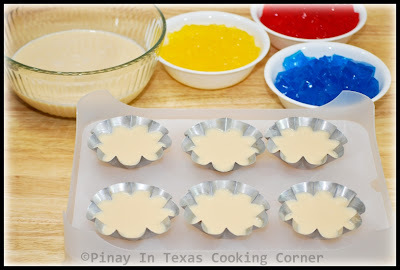 Hope na matulungan mo ko.I tried your recipe pero nung nilagay ko na ang mga jello natunaw.I waited a while para hindi masyadong mainit ang binder mixture pero hindi ko alam kung bakit nagkaganon.Masarap pa naman ang lasa ng binder,sinunod ko lahat ng instructions. I want to try this again but hopefully wala nang maging problem sa jello.thank you! I honestly don't know what went wrong with your cathedral window. It's either your binder was still hot or your jello wasn't firm enough. Hello! i tried ur recipe again today lang and i waited for the binder to warm actually almost cool na) but the jello still melted.My jello was refrigerated for 2 days just to make sure na inde cya mag-melt and set talaga cya..I really don't know what's the reason coz when i make jello I just followed the recipe in the box.Anyways thanks so much for your reply and thanks for the recipe.Maybe i will find other ways to make it successful coz the binder is really good.thanks!!! I'm so sorry to know that. I wish I could give you an answer as to why it turned that way.